Welcome back to Fanup!!! 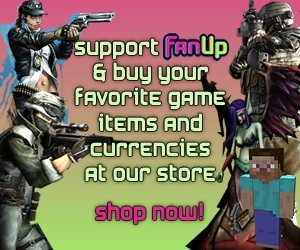 You can still earn your favorite game currencies for free by converting the fanbucks you earn into the specified currency you like!!! Here are the links for how to earn Fanbucks: http://www.fanup.com/weekly-leaderboard-contest, http://www.fanup.com/efangelist, http://fanup.com/fanup-offerwalls etc. You can also download the Fanup toolbar and do related searches that will earn you Fanbucks here:http://www.fanup.com/toolbar#. Check out the recently held contests here:http://www.fanup.com/contest so you can earn a ton more Fanbucks, easy and fast. You can ask me anything you want to know about Fanup or even the guardians. Also hope you can like this page and help out a bit;http://ow.ly/9ZKdp. Thanks and have fun on Fanup! Hide 42 comments... Click to show. Are you still interested in being a moderator/guardian for FanUp? Please send a note to moderator@fanup.com if you are. We are changing the mod program and team members. I got a question culd i still trade in 1,000 fancoins for 15fanbucks or not? just want to say thank you, pretty much everything you flagged was done so correctly. It makes my life easy! WEAPONS WEDNESDAY CONTEST OKAY WE ARE READY TO GO: $25, $15 and $10 prizes awarded to user who creates BEST WEAPONS or OTHER ITEMS content. Ends Sat Midnight See guidelines. Please don't spam my page with useless comments. Crypt , what a nerd. Congrats. FanBucks in your account. Please buy 500 Gcoin since I created this especially for you. Please delete datest9s comments above so the coins will be deleted. Also please stop exploiting the "submit" glitch to post multiple contetn. We are just going to delete all this and you will lose your coins. If you continue we will have to block you. how many fanbucks you have?